Three nights accommodation at the Moka hotel. One night half board and two nights bed and breakfast. Entrance Fees - The Museum of the Revolution, Havana Club Rum Factory and Cigar Factory in Havana, River trip and entrance to Taino Indian Village in Guama, Romantic Museum and La Canchanchara in Trinidad, Che Guevara’s Museum and Mausoleum in Santa Clara, Orchid Farm and El Indio Limestone Cave System in Vinales. This tour departs on Wednesdays. You will be welcomed at Jose Marti Airport where you will be transferred to Old Havana for your overnight stay at the historic Sevilla Hotel which is situated in an excellent position within a very short walk of Old Havana. 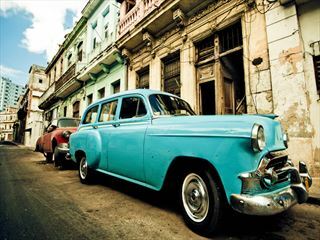 After breakfast you will depart for a detailed guided sightseeing tour of Havana. A unique experience, the tour will visit all the major sights of the city including the historic Plaza de Armas and Cathedral Square. Absorb the atmosphere of the narrow cobblestone streets of Old Havana, flanked by old colonial buildings dating back as far as the 16th Century. You will visit the impressive Museum of the Revolution and experience how Cuba’s famous cigars are still handmade by local experts by visiting one of Havana’s famous cigar factories. Also we will stop at the Havana Club Rum factory where there may be the chance to sample the different rums. Lunch will be taken at the famous El Patio restaurant situated in a beautiful location overlooking the historic Cathedral Square in the heart of Old Havana, before continuing to the impressive Revolution Square overlooked by the mural of Ernesto “Che” Guevara with the tour ending with a drive along the “Malecon”, Havana’s seafront promenade. 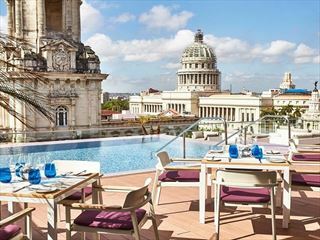 The remainder of the late afternoon will be at leisure to enjoy exploring Old Havana or relax by the hotel pool! In the evening dinner will be taken at El Aljibe restaurant specialising in traditional Cuban cuisine. After dinner there will be an option to visit the world famous Tropicana Cabaret. Set under the stars, the show depicts the history of Cuban dance and music involving over 100 dancers, making the evening an amazing spectacle. After breakfast, journey east through the sugar plantations for the city of Cienfuegos, with a stop en route at Guama where a boat is taken through the mangrove swamps to a replica stilted Taino Indian village on the shores of Treasure Lake. Lunch will be taken in a local countryside restaurant, before continuing to Cienfuegos known as the “Pearl of the South” and characterised by palaces and mansions overlooking a deep bay. After arriving into the city we will settle in at the Jagua hotel and enjoy dinner. After an early breakfast, enjoy an orientation tour of Cienfuegos including a stroll through the leafy squares of this colonial city. Then you will continue along the coast to Trinidad, a UNESCO heritage site and one of the best-preserved colonial cities in the world. The city can be explored by walking and our tour will include visits to the Romantic Museum, which depicts the lifestyle and architectural design of Trinidad’s colonial past. Enjoy traditional Cuban music at the Casa de la Trova followed by a visit to La Canchanchara, an old house dating back to the 18th Century, where we can try the unique Trinidad rum cocktail, made with cane juice. Lunch will be taken in the Grand Hotel in the city. After returning to Cienfuegos dinner this evening will be at the elegant Palacio Del Valle restaurant overlooking the bay in Cienfuegos. After an early breakfast, you will leave for Santa Clara, the final resting place of “Che” Guevara. We will visit the mausoleum and museum dedicated to his extraordinary life, followed by a short orientation tour of the city including the train “Tren Blindado” that was attacked in the decisive moments of the Cuban Revolution. After lunch in a local hotel restaurant we will leave for the Moka hotel, situated deep in the Sierra Del Rosario Nature Reserve. On arrival dinner will be served at the hotel restaurant and the remainder of the evening will be free to relax. Today visit Soroa’s prize attraction, the Orchid garden, which covers three hectares and claims to be the world’s second largest, with over 20,000 plants representing over 700 species, 250 of them indigenous to Cuba. A walk will then be taken to the waterfall ‘Cascadas el Salto’ which descends through fragrant woodlands to the bottom of the falls, which tumbles into pools, good for bathing, these waters are also said to have medicinal properties. Lunch will be taken at the Buena Vista coffee plantation restaurant after which a visit will be made to the local community of Las Terrazas, maybe buy a locally produced coffee and cake at Maria’s coffee shop on a hill overlooking the village followed by a cooling swim in the San Juan River. Dinner will be served in a farmer’s restaurant specialising in Cuban cuisine and set in a peaceful rural setting where you dine at the farmer’s house on his terrace! Today you will depart for the famous Vinales Valley where we will drive through the valley, with stops for absorbing the beauty of the area. There will be a subterranean boat ride through the El Indio limestone cave system followed by lunch in the Ranchón San Vicente countryside restaurant. In the late afternoon, return to the Moka Hotel, and dinner will be taken in Cuban’s only restaurant specializing in organic vegetarian cuisine with all ingredients produced within Las Terrazas community!!! 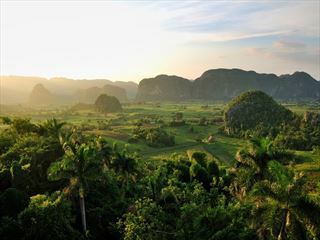 , Many previous visitors have said this is the best restaurant in Cuba, an excellent end to the day. After breakfast, free time to enjoy the additional activities on offer at the Moka Hotel and Las Terrazas. After lunch overlooking the lake we will transfer back to Havana for your return flights or onwards to Varadero where the tour ends.